Nothing brings life to a stand still quite like a flat battery, especially when you least expect it. At Automotive Assist Service Centre, we are determined to making sure that you are never caught with a flat battery. If your vehicle does lose power, we’ll be by your side with RACQ batteries for most makes and models. Visit us during business hours and we will perform a vehicle battery test free of charge for you. RACQ members save $25 on batteries* at Automotive Assist. Forget forking out money for a battery check, we give you ultimate peace of mind, free of charge. Need a replacement battery? We stock a wide range of RACQ regular lead acid, AGM and EFB batteries to suit most vehicles, including modern idle start stop (ISS) vehicles. We can also provide battery registration for ISS fitments, getting you back on the move again fast. As your local RACQ roadside provider, we can provide RACQ members with 24-hour service, 7 days a week. We know that problems with batteries can come as a surprise, so we conduct free battery checks in-store to ensure you have complete peace of mind without ever pulling out your wallet. Just like us, our car batteries can be affected by hot temperatures, with the heat degrading car batteries faster due to water loss, heat distortion and increased corrosion. As an RACQ approved repairer, you can breathe a sigh of relief knowing that we carry the best batteries designed with the Queensland temperature in mind. Regularly driving in harsher climates? Speak to us about RACQ’s new Tropical Battery, a redesigned version of the typical battery used in the majority of common vehicles that delivers better performance and an extended lifespan in higher temperatures. This battery is now on board all our RACQ patrol vehicles, so the next time you have a flat battery, you’ll know that you are always receiving the best product available, whatever climate you’re driving in. In addition to replacing car batteries, we also conduct services for alternators and starter motors to ensure that when you turn your key, you always hear the right sound. Don’t wait for an emergency, visit the friendly Automotive Assist Service Centre team at our workshop and have your battery tested. Flat battery left you stranded? Visit us today for a wide range of batteries in-store. 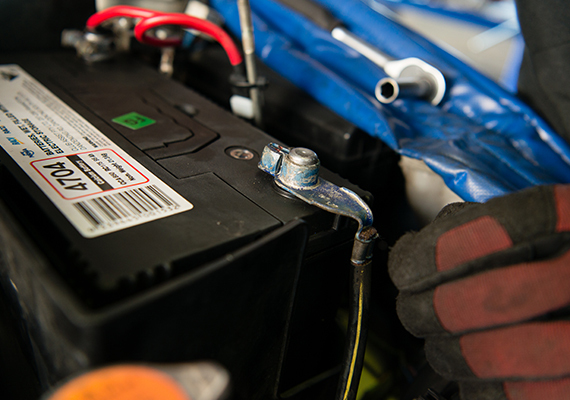 If you are an RACQ member and require a battery replacement while on the road, call 13 1905.